In case you didn’t know yet, we are now in the process of building a house. We found the lot and have met with the architect about custom designs. Since we are going with a builder’s design, we won’t be doing a completely custom house. So the next step is meeting with their Design Center to make all the decisions about interiors and exteriors. I’ve known what I want in a kitchen for a long time. 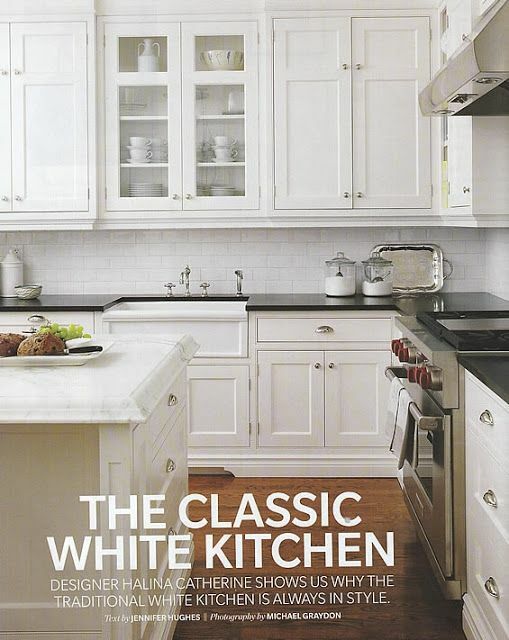 I know this might be the big trend lately, but I have ALWAYS loved white kitchens. They are so timeless and bright and pretty. I also know they will be harder to keep clean but before you leave your warning comments, I own two white couches and have three little kids. So I know what I’m in for. Sometimes when there is something you really want, you are willing to do what it takes to take care of it. In the meantime, here are a a few inspirational pictures that I am modeling my kitchen after. Yes, drool! I love how simple this kitchen is, but my husband was not on board for white counters as well as white cabinets. I have always loved the look of butcher block counters, but I currently have one and I know I would not take care of it. Since I love granite and quartz also and they are much lower maintenance, so that’s what we’re going to get. The wood flooring in this picture is similar to the one I’ve chosen. However some of our choices might change–so don’t be surprised if it’s different in the end! 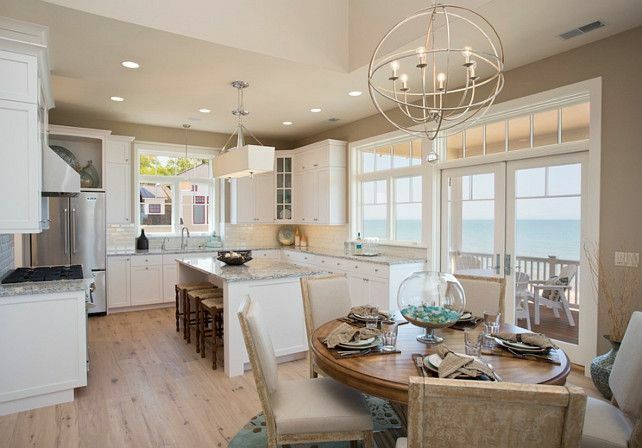 This whole kitchen is so beachy isn’t it? I can’t commit to painting my cabinets in a color since I change my decor so much. But those upper cabs with the windows are totally what I want. 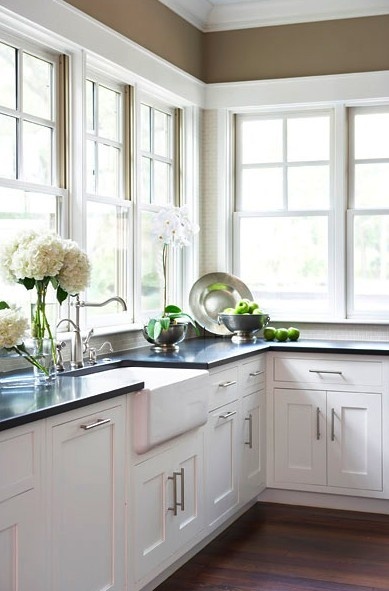 My favorite thing about this kitchen are the windows by the sink! One of my favorite things about my chosen floor plan are the large windows next to the sink. I love having natural light in the kitchen. 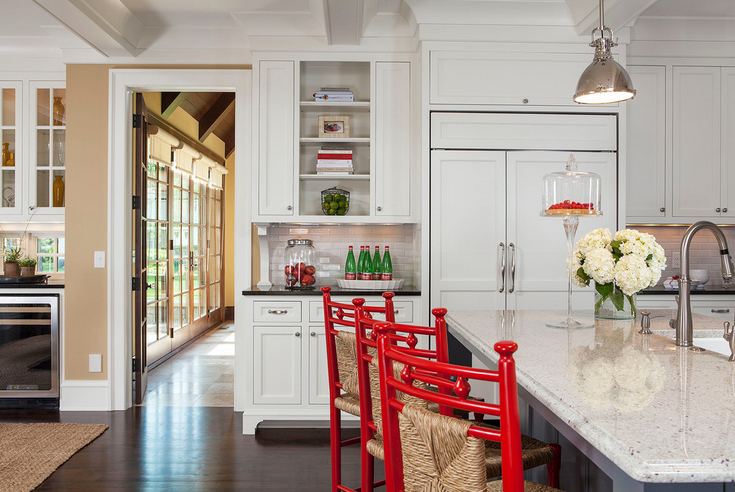 I can’t wait to add pops of color to my white kitchen–I love the red in here! I also love the hood here. We don’t have it in our budget right now, so we are planning on DIYing that sometime in the future. One thing I am actually excited for are the little DIY things we are planning to customize our home. This picture right here is probably closest to what we will end up doing. I love how the black surrounding countertops really ground the white cabinets but the white stone countertop on the island still gives you that clean and bright look. We will see. What is your favorite style of kitchen? 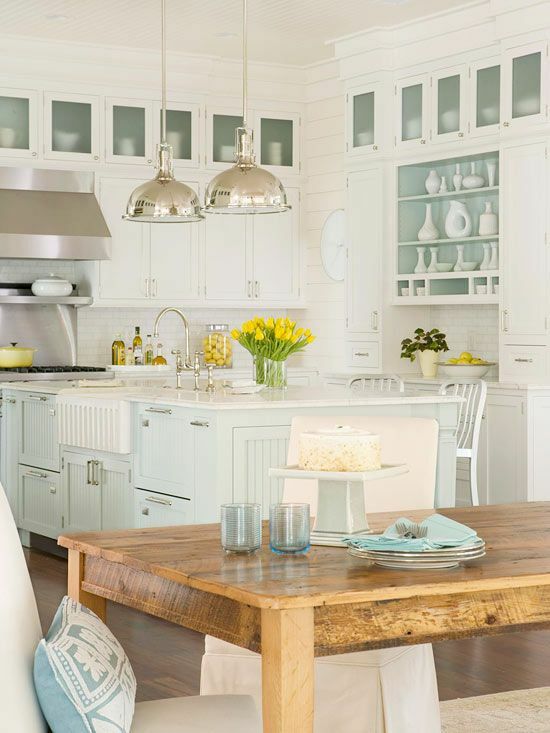 To see more inspiring kitchen pictures, visit my Beautiful Kitchens pinterest board! We are almost done with our White Kitchen renovation. I absolutely love it. It is so bright and clean looking! My pop of color is turquoise blue and my back splash is stainless steel. That backsplash has gotten so many compliments. 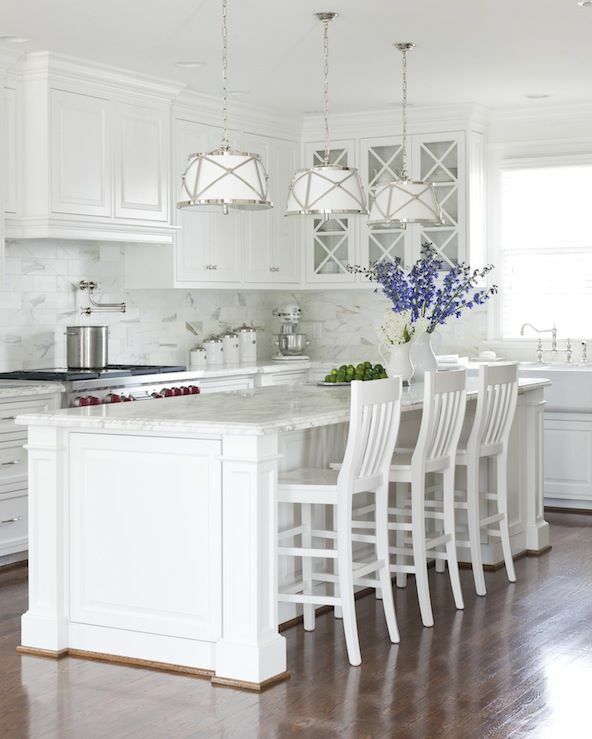 When we renovated our kitchen we chose a white kitchen and I have never regretted it. It was about 19 years and it is only just beginning show signs of age. It has looked good for a very long time and let’s face it ALL kitchens will show wear and tear. I don’t think white kitchen are any harder to clean than non-white. Enjoy your new kitchen when it is done. I really like the one with the blue/aqua island, I think it is just enough pop. Hi, I’m a new follower. 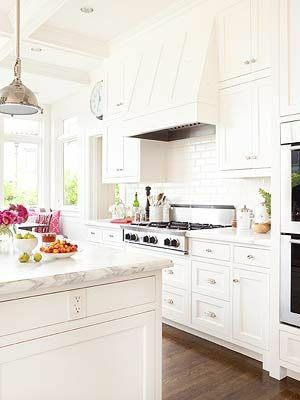 I love the white kitchens too and I also love the contrast and warmth of a medium to dark butcher block counter, but I know you have to be very careful. I wonder if there is some kind of stone or new laminate that gives that warm brown look. I know there are floor tiles that look like wood. Maybe there is some kind of product that gives the natural and warmth of wood but is more durable. Just a thought. Hi! I love to see these… we are first time home builders too right now! Fun! I want to see what you pick. Where are you building?